Ralph Johnson Bunche was born on August 7, 1904 (some sources say 1903), in Detroit, Michigan. Bunche's mother died during his early adolescence after his family relocated to Albuquerque, New Mexico; reports vary on whether his father died or left the family soon afterwards. As a result, Bunche and his younger sister moved to Los Angeles and were taken in by his maternal grandmother, Lucy Taylor Johnson, who became a major advocate for the education of her grandson. Bunche proved to be a brilliant student, graduating as valedictorian from Jefferson High School and excelling in athletics. He attended the Southern Branch of the University of California, known today as UCLA, on scholarship, playing varsity sports and working as a janitor to pay for additional expenses. He also took to working as part of a ship's crew during summers, after being made to toil upon being caught as a stowaway on his way to a college military program. Bunche graduated in 1927 as valedictorian of his class and a member of Phi Beta Kappa. He entered Harvard University and earned his M.A. in 1928 and his Ph.D. in governmental/international relations in 1934, thus becoming the first African American to earn a political science doctorate. In 1928 he also joined the faculty of Howard University, and subsequently helped to launch their political science department. He later did postgraduate anthropological work at institutions like the London School of Economics and the University of Cape Town. Bunche became co-director of Swarthmore College's Institute of Race Relations by the mid-1930s and wrote the 1936 book A World View of Race. By the end of the decade, he also assisted journalist/sociologist Gunnar Myrdal in his research for the book An American Dilemma (1944), which looked unflinchingly at racial discrimination in the United States. During World War II, Bunche worked as part of the National Defense Program and later joined the U.S. State Department, becoming a key player in the formation of the United Nations. He eventually left the State Department to join the global organization's secretariat. One of Bunche's major achievements was his efforts from 1947 to 1949 to bring peace to the region of Palestine, the site of major conflict between Arab and Israeli forces. After his supervisor, mediator Count Folke Bernadotte, was killed in a terrorist attack, Bunche was called upon to helm the talks on the island of Rhodes. The long negotiation process was defined by the diplomat's willingness to meet with both sides and be meticulous, calm and patient about getting parties to sit with each other and get used to signing off on smaller matters. The Armistice Agreements were signed in 1949. Bunche won the Nobel Peace Prize the following year, becoming the first African American and person of color in the world to receive the award. Though President Harry Truman subsequently wished for Bunche to become the U.S. assistant secretary of state, Bunche turned down the offer, citing the segregationist policies that still ruled the nation's capital and saying he did not want to subject his children to them. Bunche's work was continually informed by his belief in the power of negotiation and diplomacy over battle. Toward the end of the 1950s he had become U.N. under-secretary-general for special political affairs and had overseen the dispatch of thousands of nonfighting, neutral troops in the 1956 Suez conflict. Bunche cited this effort as "the single most satisfying work" he'd ever done, as military forces were being used to maintain peace and not aid war. Bunche continued his service into the 1960s, orchestrating the cessation of conflict in the Congo (Zaire), Cyprus and Bahrain. Domestically, Bunche also served as part of the board of the National Association for the Advancement of Colored People for more than two decades and participated in other efforts in the civil rights movement. After suffering from a number of ailments, including kidney and heart disease, Bunche died in New York City on December 9, 1971. Over his career he'd received more than four dozen honorary doctorates and many, many other accolades, including the U.S. Medal of Freedom from President John F. Kennedy. A book on his life, Ralph Bunche: An American Odyssey by Brian Urquhart, was published in 1993. Source: Biography.com Editors. 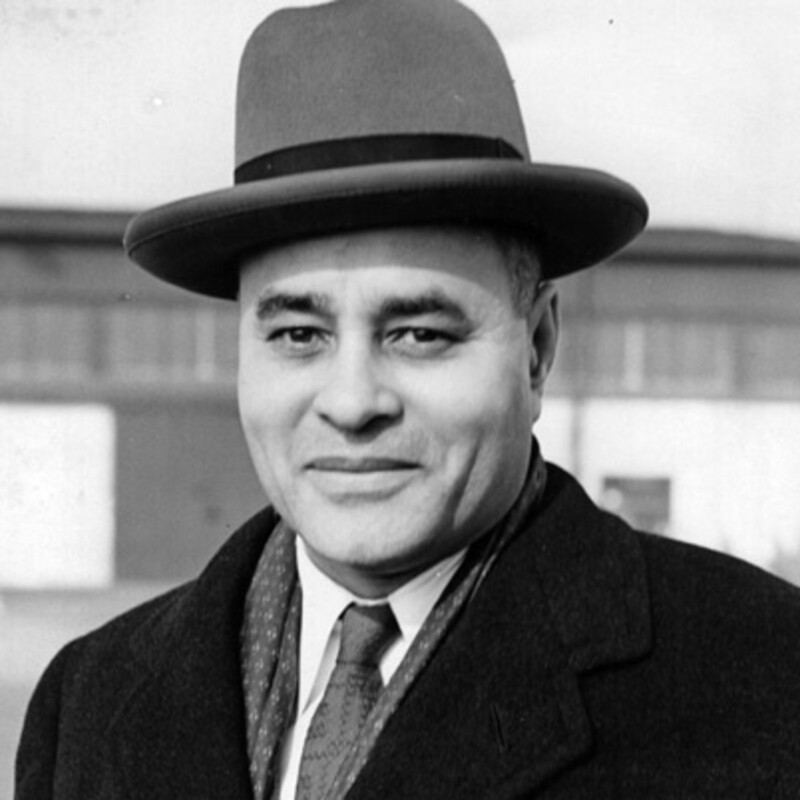 Ralph Bunche, Biography.com, (August 14, 2017).